David Miller, Åsa Ode-Sang, Iain Brown, Jose Munoz-Rojas, Chen Wang, Gillian Donaldson-Selby. The chapter reviews approaches and techniques for enagaging stakeholders in the development of scenarios, the use of participatory GIS to inform models and the role of landscape visualisation in communicating scenarios to policy makers and citizens. Engaging stakeholders in developing scenarios of alternative futures and landscape change contributes to public policies linked to the Aarhus Declaration on access to information and public participation in decision-making. The use of scenarios enables consideration of options, and assessing alternative outcomes and futures. However, narratives and storylines should consider the pathways of change which could include adverse short term impacts on landscapes before realising longer term benefits. 3D visualization tools, linked to spatially expressed scenarios and modelling, provide effective means of communicating, but need to be easily interpreted and designed with the target audience in mind, whether domain expert, policy officer, land manager, or member of the public. 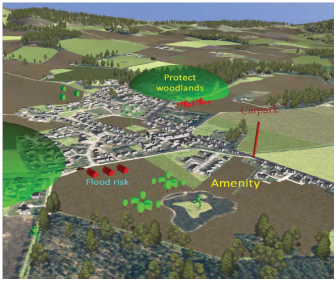 The increasing popularity of citizen science has the potential for capturing data on stakeholder’s opinions on landscapes and potential impacts of pressures for change, using 3D tools which enable geo-specific representations of alternative futures.